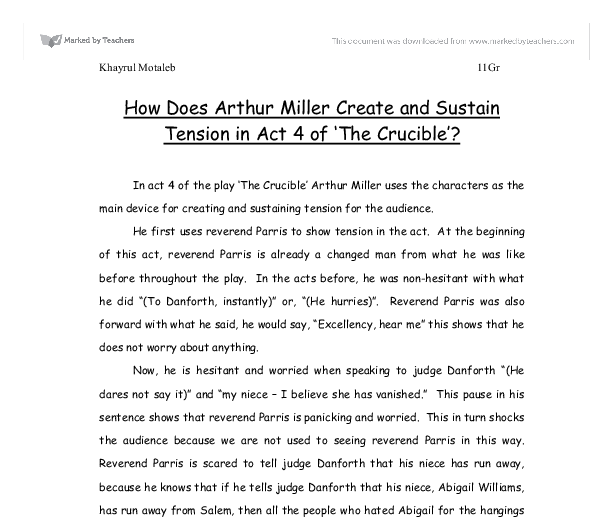 How Does Arthur Miller Create and Sustain Tension in Act 4 of 'The Crucible'? How Does Arthur Miller Create and Sustain Tension in Act 4 of 'The Crucible'? 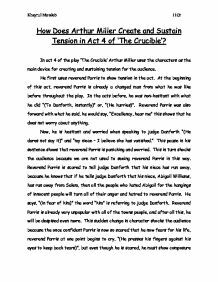 In act 4 of the play 'The Crucible' Arthur Miller uses the characters as the main device for creating and sustaining tension for the audience. He first uses reverend Parris to show tension in the act. At the beginning of this act, reverend Parris is already a changed man from what he was like before throughout the play. In the acts before, he was non-hesitant with what he did "(To Danforth, instantly)" or, "(He hurries)". Reverend Parris was also forward with what he said, he would say, "Excellency, hear me" this shows that he does not worry about anything. Now, he is hesitant and worried when speaking to judge Danforth "(He dares not say it)" and "my niece - I believe she has vanished." This pause in his sentence shows that reverend Parris is panicking and worried. This in turn shocks the audience because we are not used to seeing reverend Parris in this way. Reverend Parris is scared to tell judge Danforth that his niece has run away, because he knows that if he tells judge Danforth that his niece, Abigail Williams, has run away from Salem, then all the people who hated Abigail for the hangings of innocent people will turn all of their anger and hatred to reverend Parris. ...read more. This frustration in reverend Parris is directly related to the audience, therefore when we saw John Procter ripping up his release paper; we, the audience, as well as reverend Parris feel as though we have lost all hope. Reverend Parris makes a last attempt plea to John Procter's wife, Elizabeth Procter, to persuade John Procter to resign his release form, but when Elizabeth refuses to do so, reverend Parris really had lost all hope for his life by now. Judge Danforth was one of the main people to blame for John Procter's death and reverend Parris' life. This was mainly because of his inflexibility and stubbornness. Judge Danforth was also a person who always felt that he was superior to everyone else, therefore he uses powerful language like "There will be no postponement." This shows the audience that judge Danforth will never change his mind unless he is in trouble. This frustrates the audience a lot throughout the play and especially during Act 4. Danforth shows his superiority further in Act 4 when he says to reverend Parris and reverend Hale, "Now hear me, and beguile yourselves no more. I will not receive a single plea for pardon or postponement." Judge Danforth speaks as if he is very sure of himself right up until the end where he still remains strong and non-submissive. ...read more. This again makes the audience feel frustrated. All barriers of the past are broken however, when Elizabeth confesses that she wants John back and asks for his forgiveness. She says, "There be no higher judge under the Heaven than Procter is! Forgive me, forgive me, John" This is when John shouts out to everyone, "I want my life!" This is when we definitely know that all boundaries have been broken. In my conclusion, I would say that this Act of the play is full of suspense and tension for both the characters and the audience alike. I think that Arthur Miller has made this act so effective because he used the events of the play from real life events that happened many years before that is why I think it gives the play a sense of eeriness and truth. The play 'The Crucible' was based on a true event that occurred in 1952. In this play, there are parallels between the events that occurred in the play and the real McCarthy trials. In both of the events here, there is a fear in the people of an invisible enemy as well as a sense of hysteria and a lack of judgement of those who were pronounced guilty. Khayrul Motaleb 11Gr ...read more. The village was tightly knit, everyone knew each other and social status was very important. Arguments were common in such a claustrophobic environment. A community living in a puritan society like Salem could easily fall into a chaotic state and have great difficulties dealing with what they considered to be the worst form of evil. Not only that, but he no longer has his "good name" as he was forced to confess to his affair with Abigail. The fact he has his head down, will show the regret and shame that has burdened him since he admitted his affair at the trial. This explains why Betty loses her consciousness when he finds her in the forest. When the blame is safety diverted to Tituba Mr Parris becomes an enthusiastic witch hunter and changes his views on Mr Hale. Mrs Putnam, as well hasn't got much positive to say about her. The Crucible - Act 2 from Reverend Hale&amp;amp;#146;s entry to his exit. After Hale enters, they both calm down immediately to save face in front of the Reverend. Proctor is unhappy that the reverend came in to jibe at him for missing the Sunday mass and all the other important ceremonies like the christening of his son. (He takes a step to go and she springs into his path) as well as Proctor's desperation to escape from Abigail's wanting which is shown through Proctor's harsh words: 'I will cut off my hand before I'll ever reach for you again. John Proctor fights to not only save his wife but also for the truth and for reason. His attempts to uncover the truth bring dire consequences. Proctor brings to the judges one of the original accusers, Mary Warren, who is now his servant. Reverend Parris is powerless to help the child, as is the doctor. 'He cannot find no medicine in his books' (This is inverted sentence structure and can be found frequently in the play). 'He bid me tell you that you might look for unnatural things for the cause of it'.